The three-day feast was about giving thanks, but it wasn't much like today's holiday. 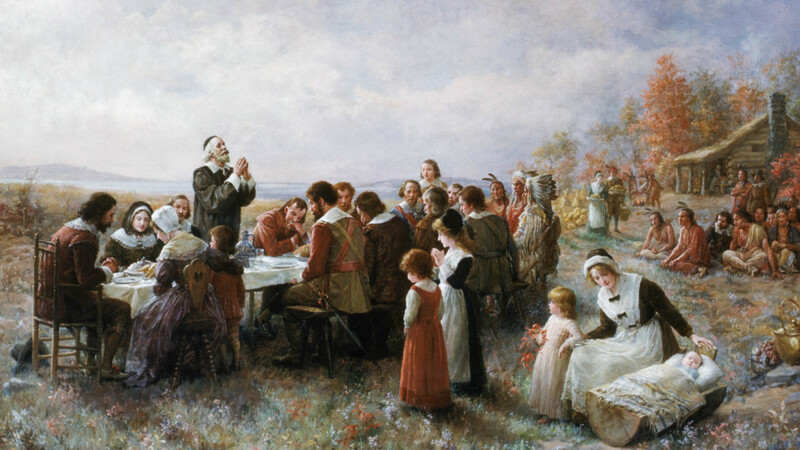 The First Thanksgiving, painted by Jennie Augusta Brownscombe. 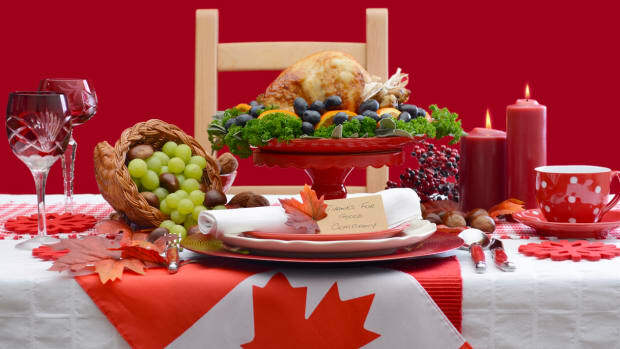 As families around the country prepare to gather with family, eat turkey and perhaps partake in some Black Friday shopping, they might be surprised to learn how much we don’t know about the origins of the Thanksgiving. What we do know is most of the adult colonists in attendance were men—and they were outnumbered by their Native American guests. Nearly all of what historians have learned about the first Thanksgiving comes from a single eyewitness report: a letter written in December 1621 by Edward Winslow, one of the 100 or so people who sailed from England aboard the Mayflower in 1620 and founded Plymouth Colony in Massachusetts. William Bradford, Plymouth’s governor in 1621, wrote briefly of the event in Of Plymouth Plantation, his history of the colony, but that was more than 20 years after the feast itself. According to this account, the historic event didn’t happen on the fourth Thursday in November, as it does today—and it wasn’t known as Thanksgiving. In fact, it took place over three days sometime between late September and mid-November in 1621, and was considered a harvest celebration. 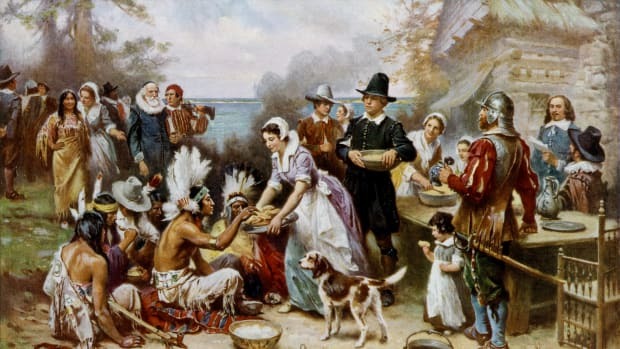 A depiction of early settlers of the Plymouth Colony sharing a harvest Thanksgiving meal with members of the local Wampanoag tribe at the Plymouth Plantation. It was a feast for a young crowd. Just over 50 colonists are believed to have attended, including 22 men, four married women—including Edward Winslow’s wife—and more than 25 children and teenagers. These were the lucky ones who had made it through a rough entry into the New World, including a harsh winter during which an epidemic of disease swept through the colony, felling nearly half the original group. Some 78 percent of the women who had arrived on the Mayflower had died during the first winter, a far higher percentage than for men or children. “For the English, [the first Thanksgiving] was also celebrating the fact that they had survived their first year here in New England,” Begley points out. The Plymouth colonists were likely outnumbered more than two-to-one at the event by their Native American guests. Winslow’s account records “many of the Indians coming amongst us, and amongst the rest their greatest king Massasoit, with some ninety men.” Massasoit (who was actually named Ousemequin) was the sachem (leader) of the Pokanoket Wampanoag, a local Native American society that had begun dealings with the colonists earlier in 1621. The first feast was also about giving thanks. While the 1621 event may not have been called Thanksgiving, the sentiment was certainly present in that historic celebration, just as it would play a defining role in how the tradition developed over the centuries to come. 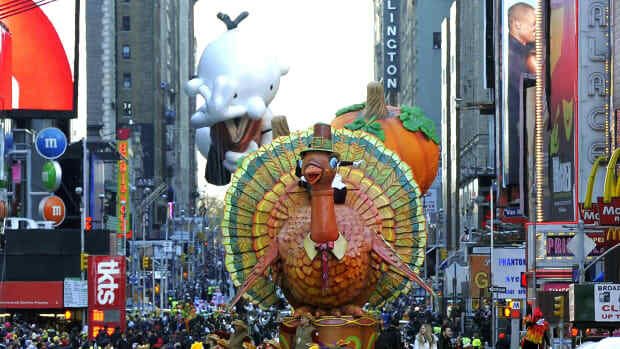 For the Native Americans at the first Thanksgiving, giving thanks was a daily part of life. “We as native people [traditionally] have thanksgivings as a daily, ongoing thing," Linda Coombs, the former associate director of the Wampanoag program at Plimoth Plantation, told the Christian Science Monitor. "Every time anybody went hunting or fishing or picked a plant, they would offer a prayer or acknowledgment." Venison and shellfish were on the menu. 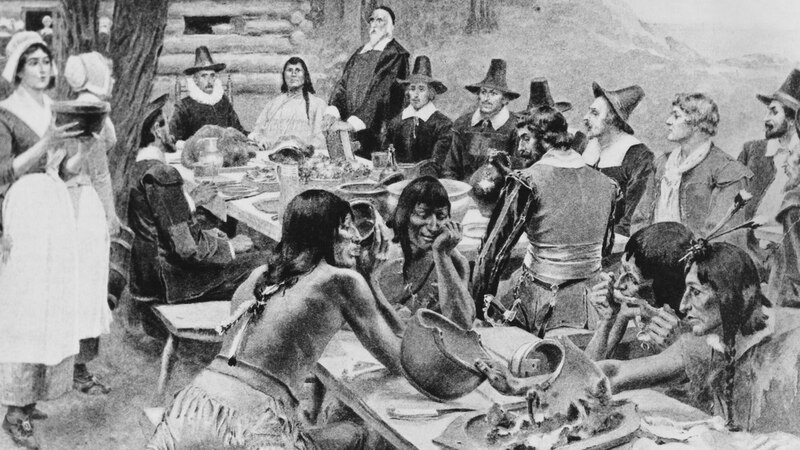 When the colonists and Native Americans sat down to feast, they probably enjoyed quite different fare than what we’re used to seeing on our Thanksgiving tables today. 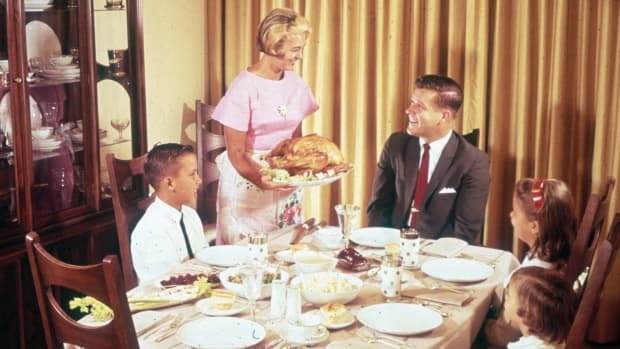 They may have eaten wild turkey, which Bradford mentions was plentiful in the colony, but it’s not certain even that most ubiquitous of Thanksgiving staples was on the menu. The Plymouth colonists certainly did not serve potatoes, which weren’t available to them at the time, and it’s unlikely they prepared the sweet cranberry sauce we know today—their cranberries were more likely a tart garnish. Pumpkin pie would have been impossible, as the colony didn’t have butter, wheat flour or an oven. The fall tradition took hold in New England. While it’s not known whether the Plymouth colonists repeated the 1621 celebration in subsequent years, the tradition of giving thanks to God merged with celebrations of the harvest to become a fall tradition in New England by the late 1600s. 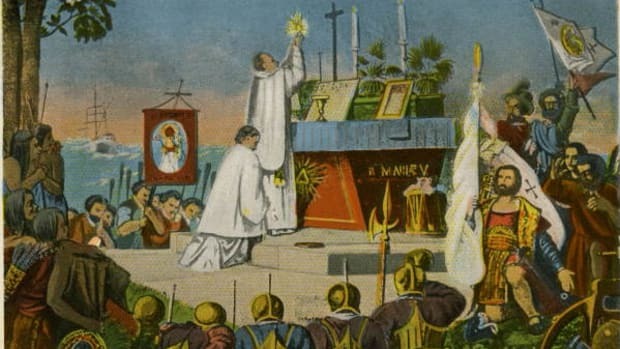 But the significance of that first 1621 harvest celebration didn’t really emerge until the mid-19th century, after the writer Alexander Young rediscovered Winslow’s letter and made it famous in his 1841 book Chronicles of the Pilgrim Fathers. Bradford’s manuscript, stolen by the British during the Revolutionary War, was recovered in the 1850s, just in time for the magazine editor Sarah Josepha Hale to incorporate it into her campaign to create an official national Thanksgiving holiday. In 1863, Hale achieved her goal when President Abraham Lincoln proclaimed the final Thursday in November as a national Thanksgiving holiday for the first time. From its roots in the Plymouth harvest celebration to Hale and Lincoln’s attempt to mend a divided nation during the Civil War, we can trace the origins of the annual celebration of family, food and gratitude we know today. As for Black Friday, that’s a whole other story.